Steeped in rich history, Hotel Metropole Venice is every inch a baroque ideal of the Italian city and its famous grand canals. Once an orphanage and church, the hotel now has an acclaimed restaurant, a series of art and curiosity collections, and a historic chapel-turned-Oriental-tearoom where Antonio Vivaldi once gave music lessons to orphans in the 1700s. 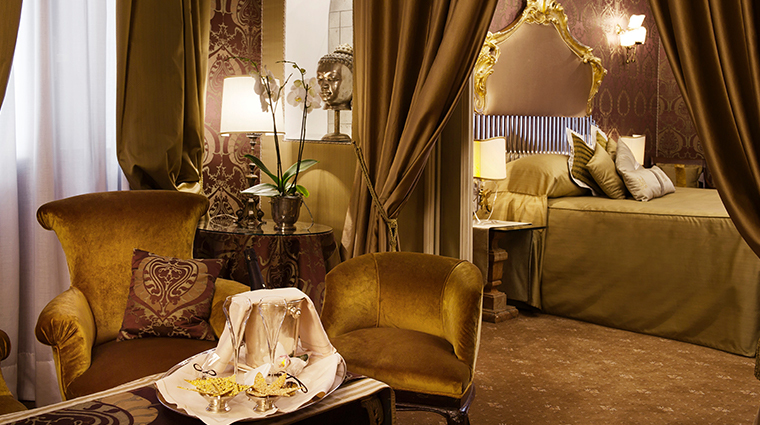 In 1895, Sigmund Freud stayed at Casa Kirsch, the former name of Hotel Metropole Venice. Renaissance painter and engraver Jacopo de ‘Barbari painted a map of the city and includes the site of this famous structure. Today, the Metropole is undetectable as a former convent, and treasures may be discovered on every floor — the family who owns the hotel has stuffed it with innumerable artworks and endlessly quirky items. It’s a Venetian dream come to life — there’s even a private water entrance for those arriving by taxi. • Since its history as a convent, orphanage, music school and hospital serving World War II soldiers, the Venice hotel has shifted to providing a luxurious place to stay — you’ll find collections of Belle Époque evening bags, hand-painted and embroidered feathers from the Art Deco period, curious corkscrews and nutcrackers, and the largest Italian collection of crucifixes. • Upon entrance, bask in the aroma of black pepper that permeates the Belle Époque parlor and common areas adorned with exotic treasures. 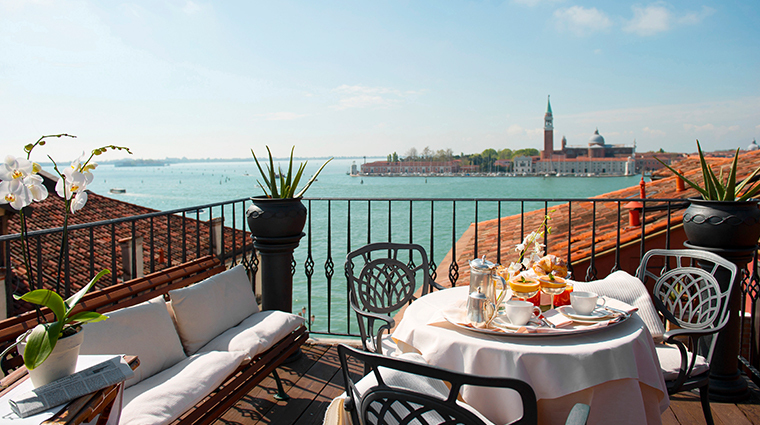 • By small fractions, the city is sinking, but the Metropole continues to rise with its Met Restaurant and status as a hotel with one of the best views of the lagoon in front of St. Mark’s Square. • Head to the tearoom, where soft music plays and the room is lit by candlelight. Here, you’ll learn various tidbits about tea and the food that goes with it. For instance, green tea is meant to brew for three to four minutes and is best served with fish; black tea is steeped at 90 degrees for five minutes and goes with caprino cheese and beef seasoned in a savory blend of Italian herbs. 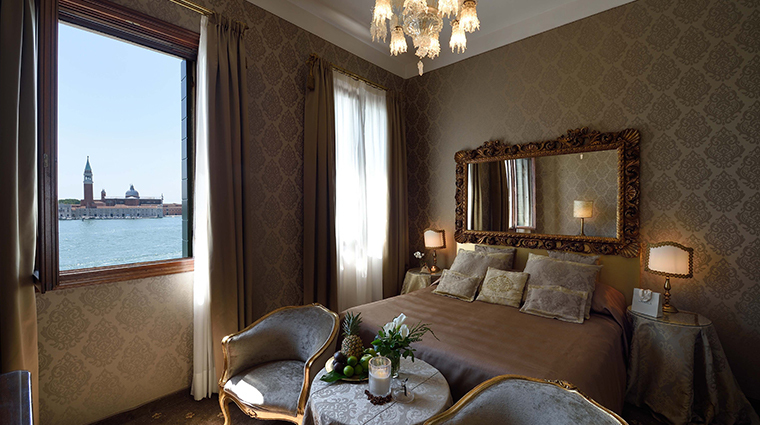 • Hotel Metropole Venice is easy to access from the Alilaguna public water transport service from the Venice Marco Polo Airport. When you disembark, you can roll your bag from the boat to the lobby. • From its entrance, a walk to the left will lead you to the residential area and produce shops; a stroll to the right will lead you along the Piazza San Marco docks toward Harry’s Bar, famous for its Bellini cocktail. • One piece of history that remains is the Oriental Bar, the formal chapel where Vivaldi used to teach music to the orphans; today it is where you can enjoy the ongoing tradition of teatime. • February is carnival time, and each year presents a new and exciting themed party at the luxury hotel. 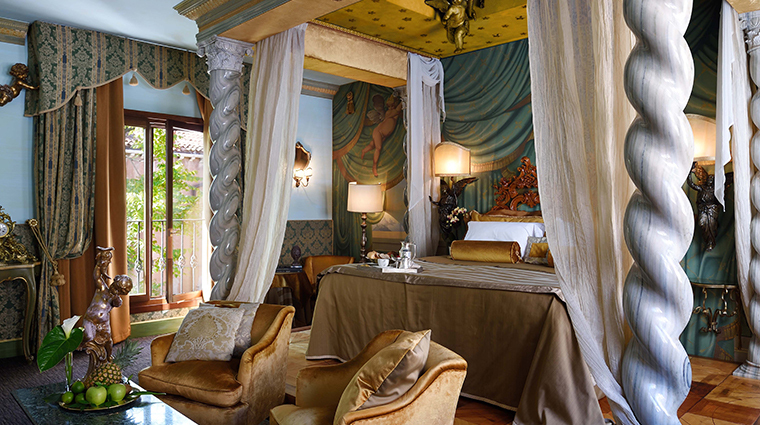 • Each suite is unique in its interior design, but all rooms offer lavish Old World European-style décor and furnishings. In most suites, the drapes match the wallpaper, bedspread and table linens. • Rooms with a view of the lagoon, canal or garden are options, as well as a magnificent roof terrace suite. • Each floor of rooms has a collection in the hallway, ranging from corkscrews to crucifixes. • Gilchrist & Soames bath amenities are provided in the ornate bathrooms. 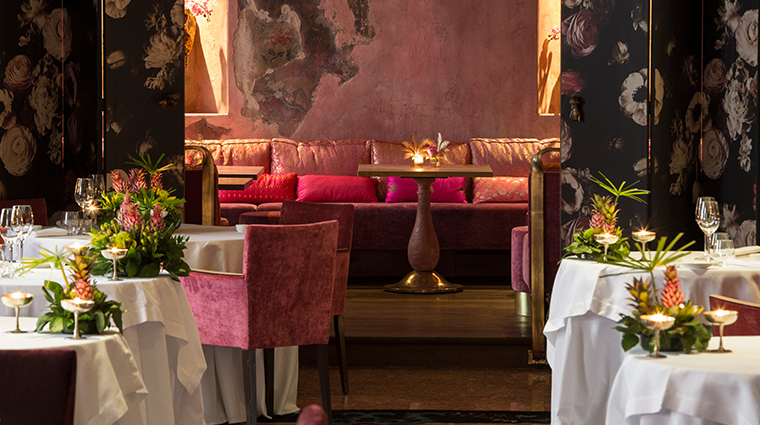 • The highly acclaimed Met Restaurant is designed like a theater with a raised stage and drawn curtains to showcase tables surrounded by antique paintings under Murano glass chandeliers. • Chef Luca Veritti creates Italian recipes in a whimsical presentation of either traditional or contemporary Italian fashion. • Fish served at the Met Restaurant is caught at the Rialto Market; vegetables are selected from the gardens at nearby St. Erasmo.